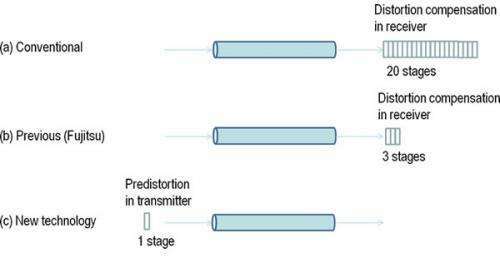 Figure 1: Ultrafast optical transmitters and receivers using digital signal processing in a trunk-line network. Fujitsu today announced the development of a digital signal processing algorithm to compensate for waveform distortion in long-haul transmission systems of over several hundreds of kilometers. This, in turn, enables a roughly twenty-fold improvement in the compensation ability per circuit size compared to typical existing technology, representing a considerable improvement of approximately three times compared to circuits previously developed by Fujitsu. As a result, the new technology has succeeded in extending the long-haul operating range of optical signals. By reducing the energy consumption of compensation circuits by two-thirds, the new technology also helps cut energy consumption throughout an entire network. For long-haul transmission systems that are used in the trunk-line networks of telecom carriers and networks that tie together large datacenters, the new technology does not require signal regenerators making for high-speed transmission systems that are low cost and energy efficient. This will thereby pave the way for networks supporting next-generation smart phones and cloud services. The receiving-side digital signal processing LSI used to measure and verify the effectiveness of the developed technology were provided by the "R&D on High Speed Optical Transport System Technologies" project sponsored by Japan's Ministry of Internal Affairs and Communications. Part of this result have been achieved by the Commissioned Research for "Research and Development on Photonic Transparent Transmission Technologies (λ-Reach Project) and Universal Link Project R&D" of National Institute of Information and Communications Technology (NICT), Japan. As the volume of data transmitted over the Internet grows with the widespread use of smartphones and the development of cloud services, the trunk-line networks operated by telecom carriers and the networks that tie together large-scale datacenters are being called upon to carry more bandwidth at lower cost and greater efficiency. Commercialization of state-of-the-art wavelength division multiplexed (WDM) fiber-optic transmission systems that can carry 100 Gbps per wavelengthmore than 10 times the bandwidth of existing levelsis accelerating, and R&D efforts are progressing to enable continuous capacity increases in the future. 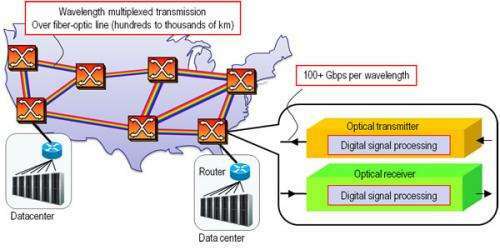 When transferred over long distances of hundreds of kilometers by optical fiber, high-speed signals carrying data at 100 Gbps or more suffer from waveform distortion caused by nonlinear optical effects, making it difficult for the signal to be correctly received. This has prompted research into nonlinear compensation technology, which can restore the signal received with distortion to a clean waveform. Because this technology, if implemented, has the ability to extend long-haul signal range without using expensive and power-hungry signal regenerators, it will lead to lower costs and lower energy consumption in networks. Fujitsu is moving forward on research and development of a method to realize the inverse distortion function of optical fiber through digital signal processing circuits built into optical receivers, and last September, the company developed a proprietary technology capable of substantially reducing circuit size. Facing a seemingly endless explosion of data traffic, however, further improvements in efficiency and power conservation are still needed. Fujitsu has now developed a technology that reduces the size of compensation circuits to about 1/20th current typical levels (and about 1/3 the size of previous Fujitsu technology), while also allowing for exceptionally high compensation efficiency. Key features of this technology are as follows. 1. A Fresh Approach: From "Distortion Correction" to "Distortion Cleaning"
Until now, receiver-end digital signal processing has been sought to restore distorted waves back to their original form. The new technology, however, takes a new approach in that it transmits additional inverse distortion in order to "clean up" distorted waves. Unlike receiver-end compensation circuits, waveforms from compensation circuits located on the transmission end do not contain noise or distortion, thereby enabling simpler computation. Existing technology has sought to be versatile in order to compensate for any kind of signal. However, such technology is quickly approaching the limits of compensation circuit miniaturization. Therefore, Fujitsu has narrowed its focus to DP-QPSK signal, which is becoming the de facto standard for optical transmission systems running at speeds of 100 Gbps. Through simplified computational expressions of DP-QPSK, it is possible to substantially reduce the size of compensation circuitry. Fujitsu discovered that converting the optical signal emitted from a transmitter with an RZ pulse greatly improves nonlinear compensation. In a transmission test at 112 Gbps, the new technology was shown to achieve, using a one-stage circuit, even higher signal quality than that obtained using a 20-stage compensation circuit in conventional technology (Figure 3). The circuit is much smaller in size so it also has greatly reduced power requirements. Using this technology, it would be possible to build an ultrafast optical fiber network at a lower cost and with lower energy requirements. This, in turn, would enable the delivery of new services for next-generation smartphones and next-generation cloud computing that require the exchange of data volumes far exceeding current levels. This technology is expected to be used in the next generation of long-haul optical transmission systems running at speeds in excess of 100 Gbps that are on track for implementation by around 2015. The technology is also being studied for a wide range of potential applications, including high-capacity short-range networks such as those used in datacenters and access networks.